Meet the two sisters proving that you can live compassionately, yet never compromise on fashion and style. 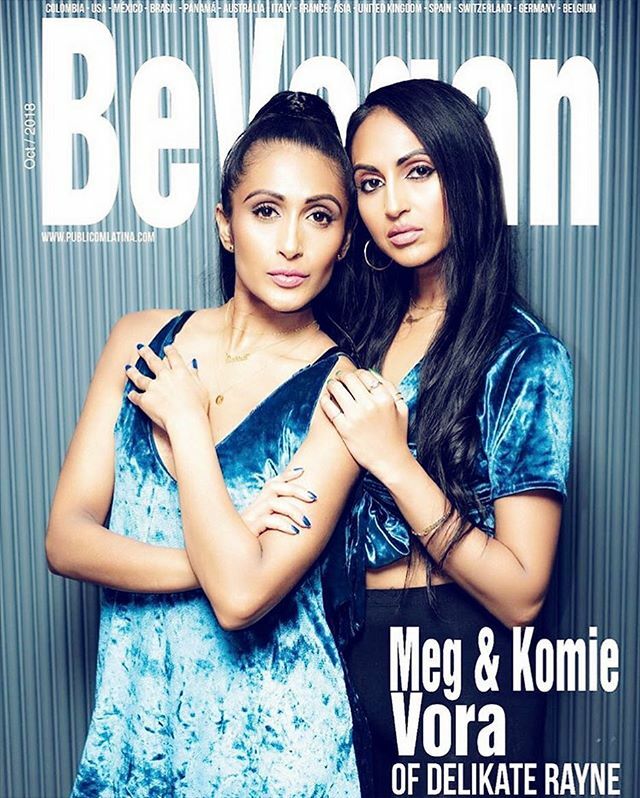 Meg & Komie Vora are the two LA queens behind Delikate Rayne, the vegan luxury fashion brand. Their stunning online boutique boasts animal-free leather, animal-free satin, lace, stylish tees, tanks… The list goes on! Can you tell us a little bit about both of your backgrounds before Delikate Rayne? MV: Yeah...I am really attracted to the way fashion serves as the perfect outlet for expressing emotions and personality. It's the one thing where you don't have to pay attention to any rules and can truly make it your own. I loved re-designing my Indian outfits growing up whether it was creating a new version of a blouse for my sari or draping and tucking fabrics to create an edgier version of the traditional garb. I am also forever obsessed with thrift stores and have always had a massive affinity for reconstructing my finds. The creativity you can emulate in this way is limitless...I like the idea of giving a second life to a discarded garment and creating a new reality for it. Who inspires you most in the fashion industry, and why? MV: It's not so much who but more like what. Usually the mistakes I have learned from- they create an air of the unknown. That mystery paired with the want to offer beautiful animal friendly alternatives serves as a perfect canvas to create. Along with all the people I see in the streets who have that intriguing, elusive quality that you can't quite put your finger on but it leaves you wondering about them, wanting to know more- it's that 'je nais se quois. KV: I admire individuals who stand up for what they believe in and go after what they want. The biggest influence is my strong desire and want to educate people and offer alternatives to help end animal cruelty. What do you think the biggest issue in the fashion industry is at the moment? The whole manufacturing process is creating massive pollution and cruelty. The way it is consumed, made and disposed of. From the working conditions to how people who work in factories are treated, the way things are being disposed of (dye discharge, textile waste, overruns etc. ), the animals we are killing for textiles, the amount of new product being created w/out any sustainable factors attached etc. all of these components are contributing new sets of issues and the ramifications of it will be here a lot longer than people realize. It's really causing massive, detrimental harm not only to our home-planet earth but to animals and humans as well. Do you think luxury brands will ever ditch leather? MV: Yes...I think anything is possible. Many fashion houses and people were skeptical in denouncing fur as luxurious but now it is widely deemed as disgusting. The connection between leather and animal cruelty is not as obvious to people as fur is. So as consumers become more educated and the demand continues to rise for compassionate alternatives, leather will have a much greater chance at being phased out for good. KV: Definitely. As the awareness increases about the link between animal cruelty- where leather comes from, how it is actually obtained etc. more people are going to want to stop affiliating with it just like they did fur. Plus as the cruelty-free options for leather continue to evolve it will make is easier for shoppers to choose the ethical version. (Photo Credit: Delikate Rayne) Models wearing clothing from the Delikate Rayne range. What advice can you give to those wanting to start their own clothing line? MV: Hone in on what is unique and special about what you are offering and embrace that specific point of view. It's important to remember- Nobody knows all the rules, not now, not ever so just worry about what you are contributing. Always expect the unexpected.The fashion industry is constantly evolving and when your dealing with a specialized type of niche as well (whatever yours might be), the best thing you can do going into this is realize your experience will teach you more than what you think you know now. Your initial knowledge will aid you in getting your vision off the ground but the actual process of creating it is where you will learn the most about what works and doesn't for you. It is a lot of trial and error which is essential to growth. Persistence and the ability to evolve based on the hands you are dealt will take you far. KV: You have to be prepared to work really hard and ready to wear many hats. You are no longer just responsible for one job you are going to be hired to do all jobs in every department until you find someone who can perform that task better than you can. Make sure you are extremely passionate about what you are doing. Truth is, it’s going to be ridiculously challenging, and if you don’t have the ultimate burning desire to do what you are doing you will eventually give up. You have to be willing to continuously keep educating yourself and be flexible. It’s a fast paced industry so be able to adjust for change at any given time. You’ll often feel like you aren’t ready or it’s not the right time. You need to start making every moment the right moment. Alongside continuing to be the voice for the voiceless. We will be making sure Delikate Rayne keeps pushing the boundaries of cruelty-free fashion while educating consumers on how to make better purchasing decisions on a greater scale. It's important to us to continue to create awareness so more than just the average vegan consumer is on board. We are working on securing a few collaborations outside the vegan sphere to take place that will spread the message to other markets which is vital to our industry as a whole’s advancement. Also moving towards a updated, made over DR Diary site that will be everything it is now but better, a more in depth lifestyle site with a few surprises. Stay tuned! Not only do we have talks from pioneers in the ethical fashion world, but we also have a Fashion & Beauty panel with some awesome panelists. Schedules are being released over on social media, so make sure to follow us on Instagram, Facebook, and Twitter to keep updated.